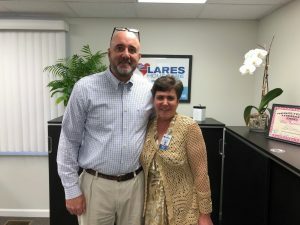 Our Employee of the Quarter Program recognizes the outstanding qualities and contributions of employees working towards Lares Home Care’s goals and overall mission. This quarter we congratulate two employees that have gone above and beyond in their efforts to provide care for our clients. The first Employee of the Quarter is… Robin Lejda. Robin Lejda – A Certified Home Health Aide for more than 30 years with specialized training in Alzheimer’s care, she has taken all shifts asked of her even on a last minute’s notice. She communicates with our team on a regular basis regarding patient care as well as her availability to step in whenever and wherever she is needed. Robin has proven to be a valuable addition to the Lares Home Care family! Congratulations and thank you!! The second Employee of the Quarter is… Earnestine Weston. Earnestine Weston – A Certified Home Health Aide for nearly 20 years, she consistently receives praise for her caregiver skills. 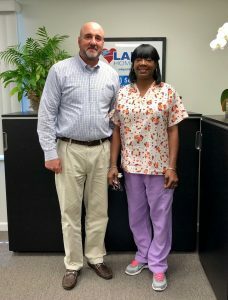 Clients have commented, “Earnestine is excellent in all aspects”, and “We are 1000% pleased with the care she provides.” In addition, Earnestine has the distinction of being our top Dementia certificated caregiver, after completing over 35 training courses, she is certified in both Dementia Care and Advanced Dementia Care. Congratulations Earnestine and thank you!